“We’re going to a mall.” It was 8 a.m. and Mr. Misadventures had just indicated we were going shopping. So I wasn’t exactly jumping for joy when I heard shopping mall! I really should have known better. Mr. Misadventures wasn’t really interested in torturing me. He wanted to see the fantastic architecture of Namba Parks Shopping Centre in all its glory (and before the shoppers arrived). 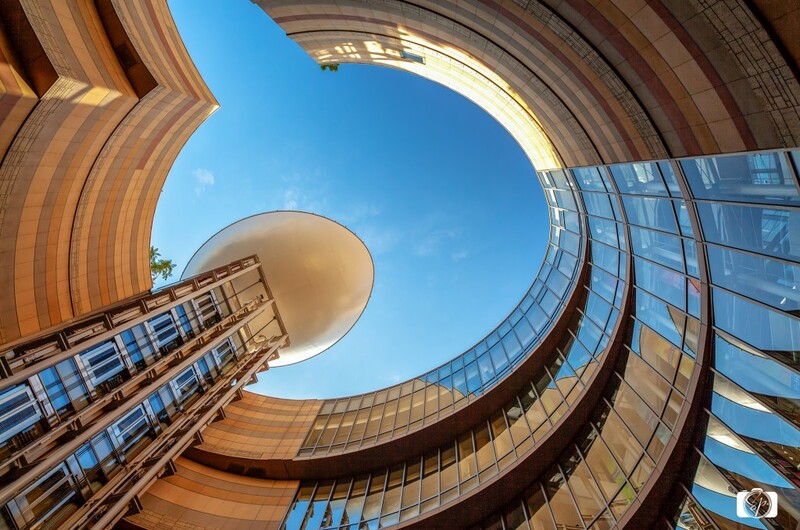 You see, Namba Parks is an extraordinary shopping and office complex consisting of 120 stores and 8 rooftop gardens. 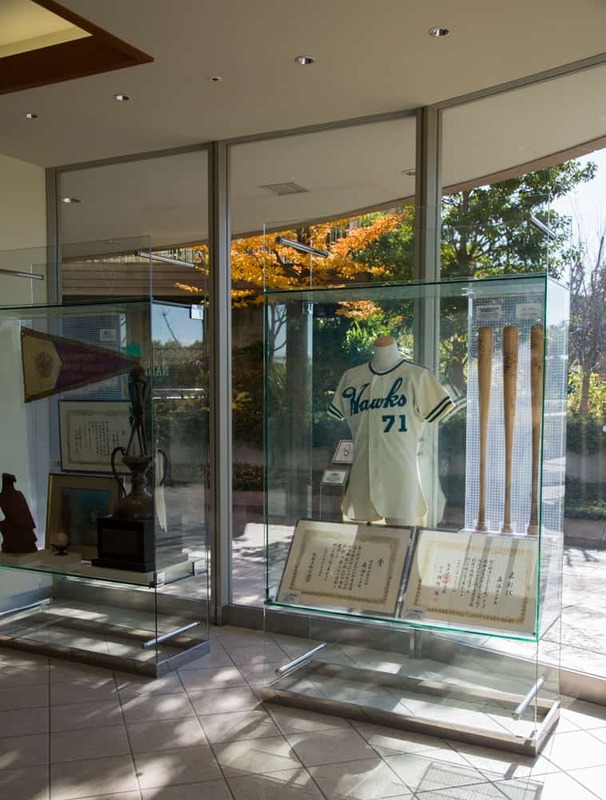 It is located in where the former Osaka Stadium (baseball park) used to stand. There is actually a baseball museum in Namba parks which I later checked out while the hubby was photographing the exceptional architecture. They call it Namba Parks because of all the trees inside the parks around the upper levels. Every photo of the buildings looking up from the ground floor has trees. The park gardens don’t open until 10 (stores at 11) so we had plenty of time to take photos of the buildings without people popping in unexpectedly! Some of the sides of the buildings reminded us of The Wave in Arizona. 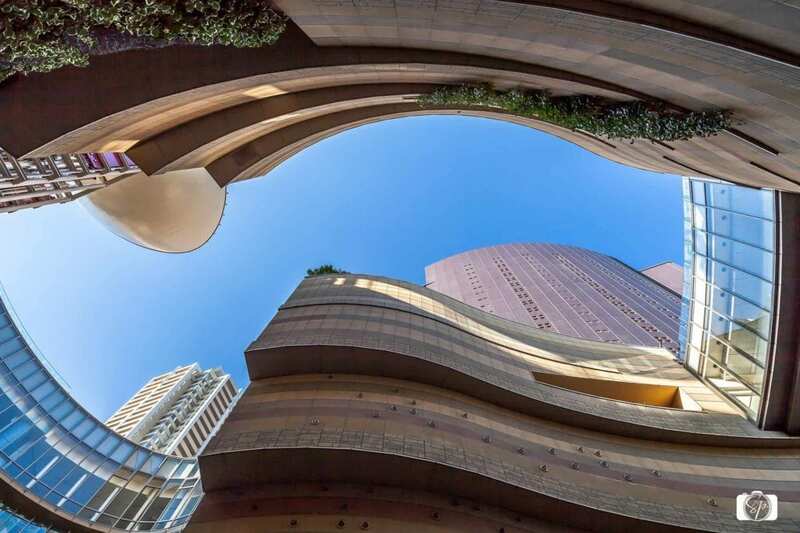 The building was designed by an American architect named Jon Jerde who specializes in shopping centers. 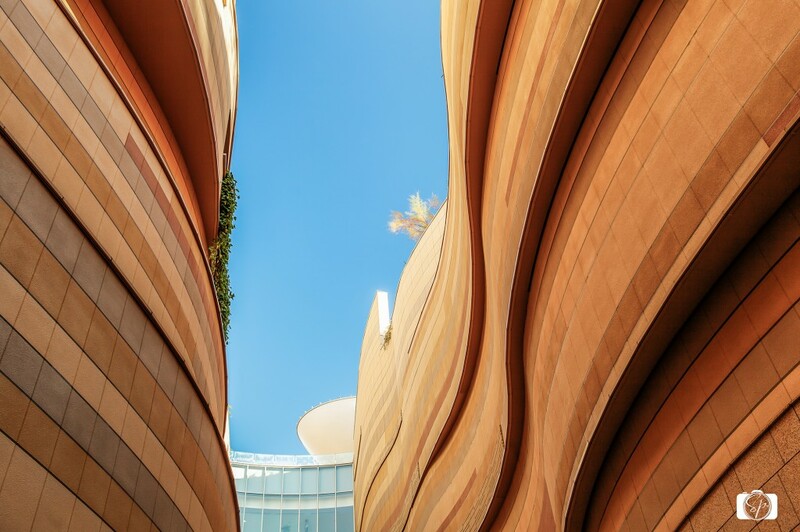 He and his firm have created beautiful buildings all over the world (more here) as well as several spots in San Francisco Bay Area including the shopping center I go to several times a month to see movies – small world! After wandering around for an hour or so we headed to back Kuromon-Ichiba Market for a little snack. It’s only a short walk from Namba Parks. We later returned to Namba Parks to access the upper terraces. 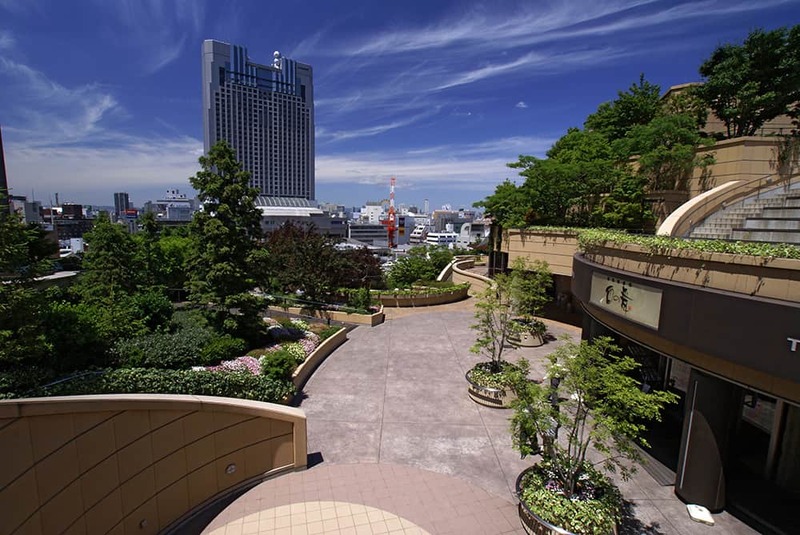 Big cities like this in Japan city are densely populated and nature is pretty nonexistent, so the rooftop gardens that flow through eight levels covering several city blocks and which eventually connect to the street are extraordinary. They’ve made it easy for pedestrians to slip in and out of little havens of green grass, trees, rocks, cliffs, streams, waterfalls and terraces. I have never seen anything like it. Watching Mr. Misadventures work makes me hungry and thirsty. In the morning before the shops opened I had my eye on Saryo Cafe, an organic cafe that served donuts fried in olive oil. Which to choose? The kitchen inside was miniscule and it was incredible to observe the cook as she prepared orders all while keeping her tiny space spotless. She was literally working on one burner! I dragged the hubby inside and had one of the donuts along with a warming cup of matcha green tea. My sweet reward for all that photo assistant work! There is something for everyone at Namba Parks. Shops galore! Architecture. Nature. 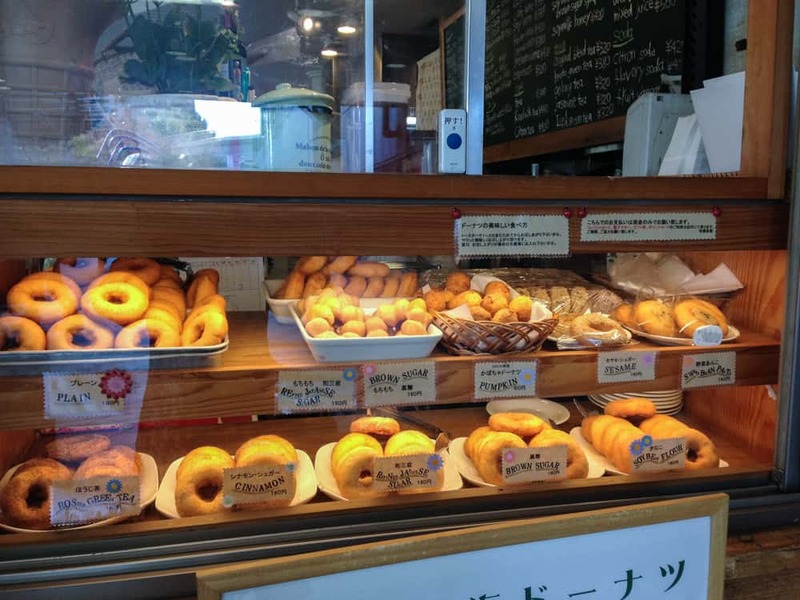 Organic donuts (and many more restaurants). There are concerts and light shows, it is definitely a destination. It is also super easy to get to. How about you? Have you ever been to any place like Namba Parks? Fantastic pictures!!! Thank you so much for sharing them. I have never heard of Namba parks. I have been thinking of heading to Japan within the next couple of years if I can. It’s on my list of places to visit. This place looks like something out of a Salvador Dali painting. @Murissa, I was totally surprised by the architecture of the place, I am sure there is probably a building somewhere in BC that this guy helped design, he seemed to have designed buildings all over the world! It was interesting to see all the iterations of Namba Park but the organic donuts are the cherry on top! Wonderful pics! 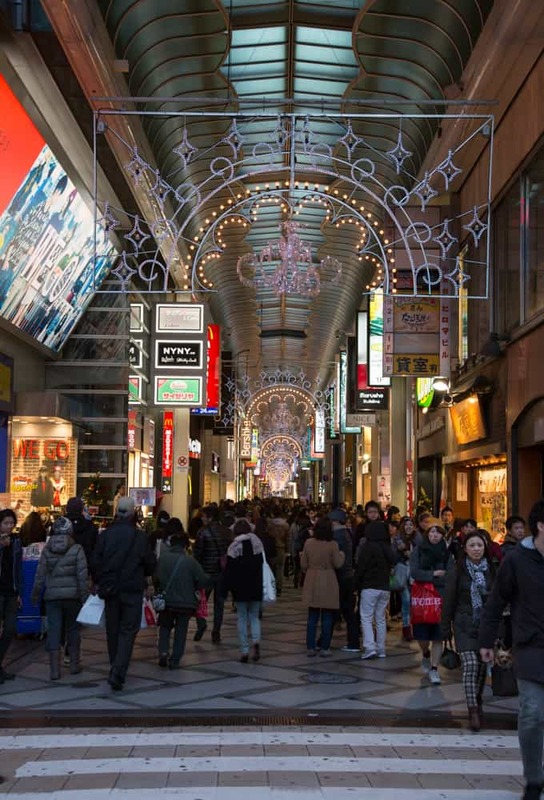 It’s been years since I’ve been to Osaka, and I remember those ubiquitous malls as well! It’s great to see you found some alternative sights, makes me want to go back there and check them out too! @Anita, my hubby is good at finding all the angles! I didn’t spend enough time there – never really had a chance to do ramen, which I am very regretful about! Wow, what an amazing place to visit. That architecture is amazing. 1- That donut looks amazing & 2- how freaking awesome is that shopping center! I love the view from the top to where you can see it was a stadium! It’s so cool to see them turn an old stadium into something so cool! @Erica, it is a pretty neat spot and next time I will skip breakfast and eat more donuts as it was awesome and there were other flavors I would love to try! I love matcha green tea! It’s great in smoothies too! Looks like a cool place. @Candace, I have recently seen people doing that and I totally want to try that out! That shopping center really does have some fantastic architecture! That place is amazing!! I would be enthralled by everything!! Gorgeous pictures. I am on a Matcha binge…Love it! @Letty, me too! Love matcha everything! Those are some fantastic pictures. Looks like a fun day. Wow, I seriously love the pictures looking up to the sky. Really makes you admire the architecture. My Father is an Architect, so I’m familair with taking in scenes like this. @Nancy, I can imagine that depending on the season at the clouds in the sky that the pictures of the buildings could be constantly different. @Ananda, darn delicious for sure! What an interesting shopping center! I love, love, love it when places incorporate trees and green things in public spaces! It always makes them more inviting. It’s a scientific fact that people are happier when they are around nature! Thanks for the great pictures and showing us such a cool place. @JoAnna, I think it is especially important in a place like Japan and in cities like Osaka and Tokyo where the cities are super crowded, the spaces are very small and people have limited access to green things. Namba Parks looks amazing. The architecture and rooftop gardens are beautiful. Love all your pictures. The donut looks amazing! The architecture here is stunning! Wow. We went to a mall in Malmö that had wonderful architecture. 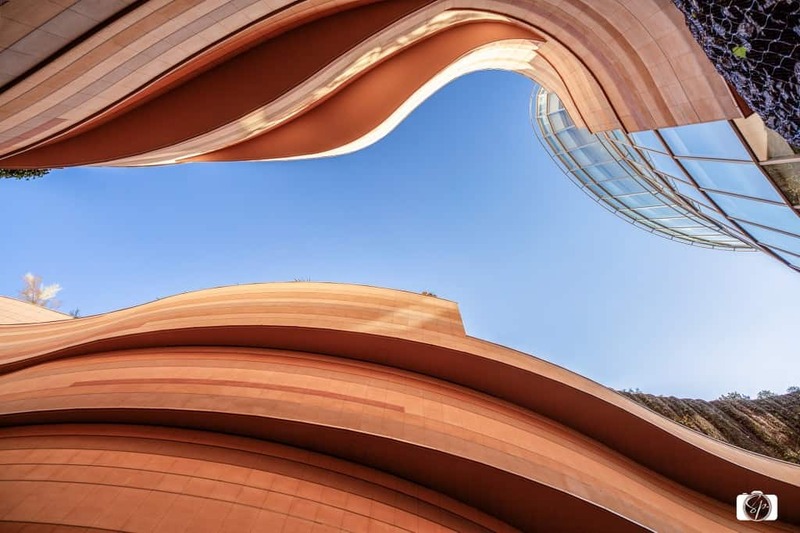 Interesting building shapes, and beautiful photos of them. Thanks for sharing. Wow, what a cool place! Love those buildings! @Tanya, it is easy enough to do there, it is huge! 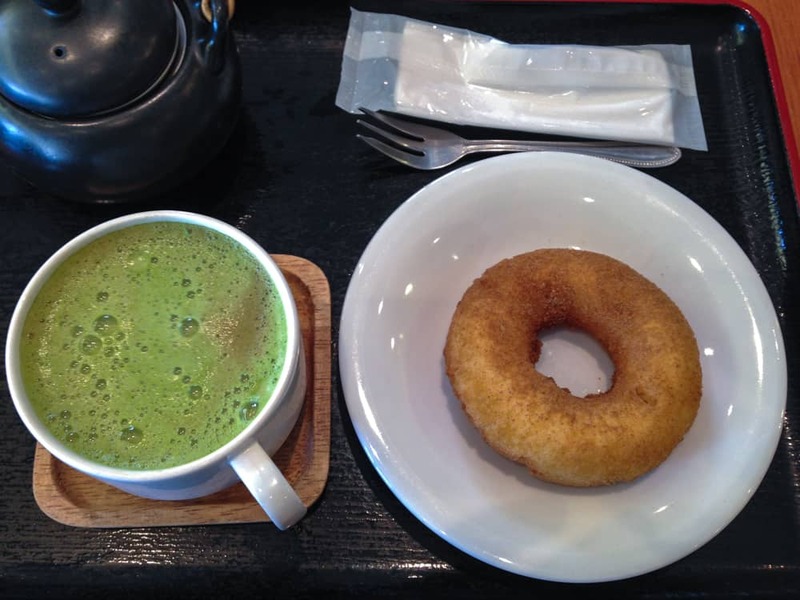 Namba Parks looks so nice, and the tea and donuts look tasty! Incredible Architecture! My neck would hurt from staring at these buildings! @Brenda, I guess that is why they have all the little mini-parks, so you can rest your neck! OMG! This looks amazing and totally something I want to check out! My husband have traveling to Japan on our bucket list and this is something we will most definitely add to the itinerary! Thanks for sharing! 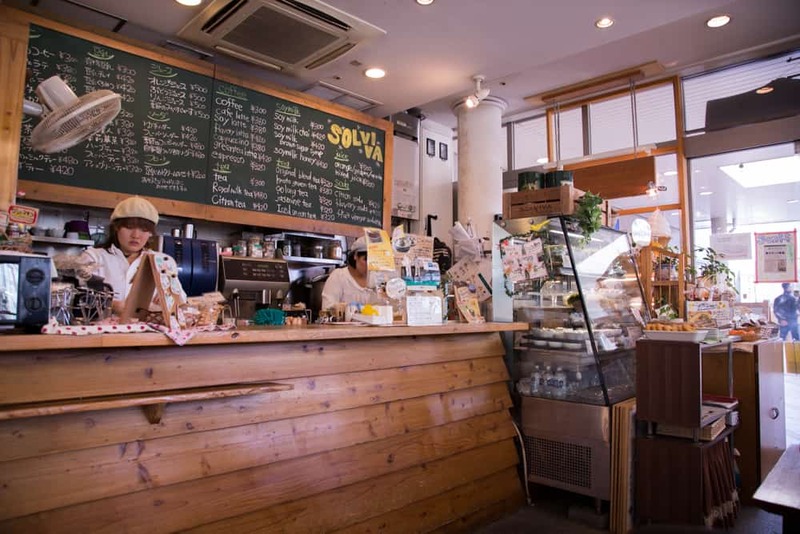 @Avie, definitely do, there is so much to explore in just this one spot, but plenty of other things to do and eat in Osaka! These photos are so cool! Did you take all of these? They are beautiful! @Alex, no my hubby, he is the photographer in the house although from time to time I can do a decent shot. Wow. What a fascinating place. I think one could explore for days. Not to mention eat donuts. @Patty, for sure! It is like a little city! That’s an interesting mall. It still looks like a stadium to me though. You definitely were able to capture the beauty of the architecture with your pictures! I’m feeling inspired to travel. @Ashley, most of the photos are my hubby’s and he will be pleased you enjoyed them! That is so damn cool! I had no idea that was even a thing. That place looks amazing and what a clever idea of retaining the ball park’s general infastructure and building with it, rather than demolishing it. I definitely want to see this place myself. Thank you for sharing this. @Nile, it is quite beautiful and there is so much to do it is like a little city in itself! These are some beautiful photos! It looks like a wonderful place to visit. Thank you so much for sharing!!! @Amanda, the photos are my hubby’s and he will appreciate the compliment! Wow, now that is very cool! What a great idea to make an old ball park a mall! What a lovely looking place, I would love to go there. The picture’s look amazing and this is another bucket list visit. I love going to different places and capturing the beauty of each place. @Tamika, it is important I think, in places like these, there is no way to visit everything, so it is important to explore a few places a little more deeply. WOW, those pictures are amazing. Thank you for sharing. I have never been to a place like this. The rooftop gardens would be where you would find me. I love the photos you took. @Ann, I sat in many of them waiting for my hubby to finish taking his photos! The stadium has quite a history indeed. The pictures look amazing for sure. I would love to see Osaka Namba Parks. It looks and sounds amazing. Thanks for sharing. @Rebecca, it is a pretty cool spot and there was lots more to explore there! @HiLesha, Japan is such an awesome place for baseball fans! @Emma, it is, my hubby had a blast and I got my treat too! Wow, I have never been to a place like this before. It’s absolutely beautiful and the architecture is amazing. You have inspired me to want to see more of the world. Thanks! @Lauriel, Japan is someplace I would love to live for a year just to get it out of my system! Matcha anything is delicious in my book!